The Great River Passage initiative preserves and enhances our experiences with the Mississippi River in Saint Paul. Seventeen city and regional parks connect to the 17 miles of river that flow through our city. One favorite riverside location is Hidden Falls Regional Park. Approximately 500,000 people visit the park annually. Hidden Falls welcomes all people through programs and events (many free to the public) and self-driven activities like fishing, boating, biking, photography, hiking, card games, grilling, running, dog walking, family gatherings, or simply as a place to relax and watch the river. A snapshot of the last 30 days illustrates how people participate in programs along the river in this gorgeous park. The Annual Great River Race and Wilderness Inquiry’s 40th anniversary took place September 15. Twenty-nine teams loaded into Voyageur Canoes to race the six-mile river loop. The team from VAA Engineering took first place with a time of 57:56 minutes. 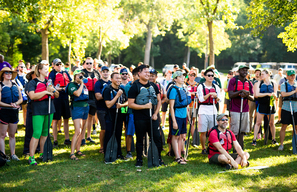 More than 300 people attended the event which raises funds for Canoemobile Minnesota, a Wilderness Inquiry program that connects more than 18,000 Minnesota kids to outdoor opportunities annually. Many trips launch from the Hidden Falls boat launch. National Public Lands Day on September 22 was presented by Saint Paul Parks and Recreation and Minnesota Department of Natural Resources along with 21 partner organizations. Nearly 900 people attended the free event celebrating our public lands. 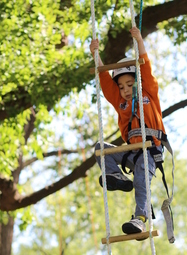 Partner organizations facilitated activities including tree climbing with Saint Paul Forestry, building buckthorn walking sticks with Urban Roots, a story walk by Saint Paul Public Libraries, fishing with Tips Outdoors, painting with the river activities by Great River Passage, and much more. The event organizers focused diligently on accessibility this year making certain there were no limitations in people’s ability to participate. The river is not just a place for recreation, it is also a training ground for city and state workers. 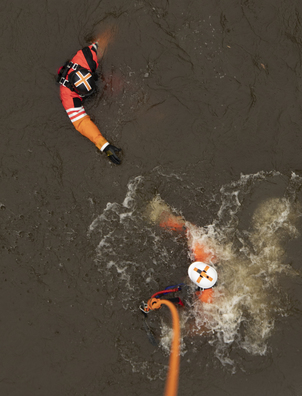 On a brisk fall morning on the Mississippi River, the Minnesota Aviation Rescue Team conducted one of their many helicopter and water rescue trainings at Hidden Falls Regional Park. This unique intergovernmental partnership between the Minnesota State Patrol’s Aviation Division and the Saint Paul Fire Department has been in place since 2011. Read the full story here and see stunning photography by Great River Passage Photographer in Residence Chris Juhn. Saint Paul Parks and Recreation Design and Construction division is currently updating the master plan for Hidden Falls and Crosby Parks. The Master Plan will guide park improvements and natural resources management, and make recommendations for changes within or adjacent to the park. Your input is invaluable. Take the survey and follow the progress.